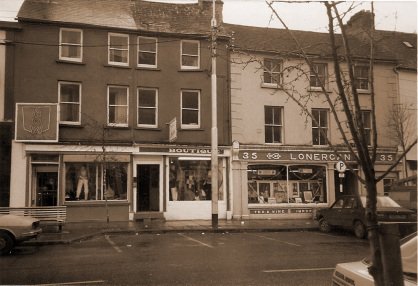 31 Main St., Clonmel. Charles's Drapery Shop. 4.03) Charles Patrick Frederick Byme (1843-1921), was born in March 1843 in Sleaty. With the gradual economic downturn caused by the great famine of 1840-48 and then the loss of the estates Charles like his forebears had to make his own way in life. Being the eldest son and without any qualifications other than the son of a gentleman farmer he was apprenticed at the age of about fifteen to a draper, Mr. Deery, who kept a shop in Tullow.ln 1852 with no income from the estates his father Gerald emigrated to Arkansas in the USA where he died unexpectadly in 1858. With only the widow and a young penniless family the prospects of staying on in Sleaty were very bleak. Eventually the residue of the estates were taken over by the Encumbered Estates Court and sold by public auction in 1864 leaving the family homeless. According to the Sleaty Byrne pedigree by John Browning, Charles left Tullow and went to look after his mother, Eliza Byrne and siblings in Co. Tipperary. From there he went to work in Pirn's department store in Dublin. It is known that he visited his spinster aunt Mary and his sisters Emily and Clare in Kingstown in 1868, where he also met his mother. Gerald married Kate Mary Carroll, a dressmaker, daughter of William Carroll of Bolton Street, Clonmel, 15th July 1869, in St. Mary's Church, Irishtown. Charles and Mary had seven children whose births and marriages are recorded on the inside cover of the Byrne family bible, an heirloom copy of the Rhemish Holy Bible 1791, see above. This bible was handed down thro the family from Charles Byrne of Sleatyin the late 1700's. Around the turn of the century Charles established and ran his own successful drapers shop at No. 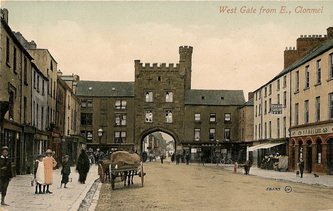 31 Main St.,( red and green shopfronts above) near the West Gate, Clonmel. 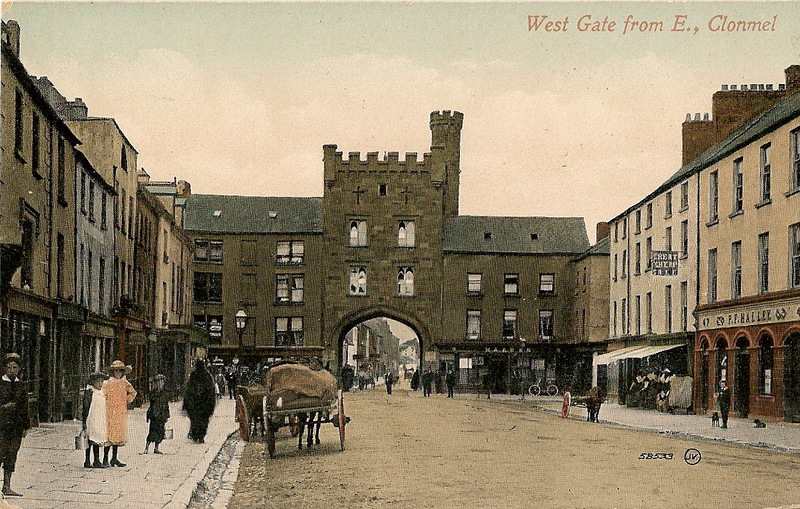 He died in Clonmel in 1921 at the age of seventy-eight.